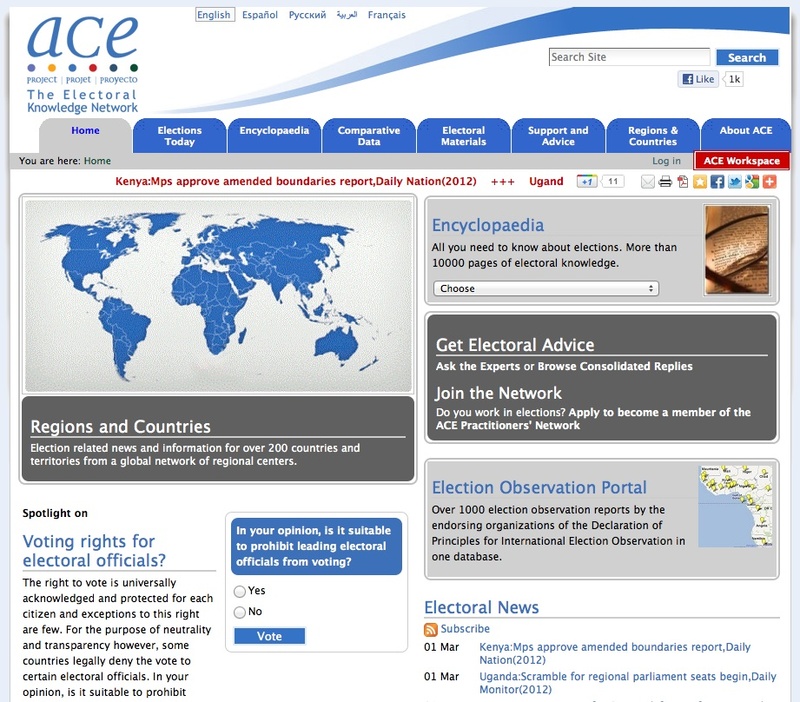 As a partnership formed by six international organizations in 2004, the Administration and Cost of Elections (ACE) project provides, through its online Electronic Publications, info, texts, and data on elections and their administration, with a specific focus on options, detailed procedures, alternative solutions, the administrative and cost implications associated with organizing elections. The ACE website also provides complete and systematic information on electoral systems, although the general updating rate is quite slow. The web-pages are currently available in English, French and Spanish, and some parts also in other languages such as Arabic, Croatian, Albanian, translated by the partner institutions. Sample materials, such as elections manuals, innovative and cost-effective country case studies for comparative purposes and a glossary of elections wording are also provided. Records are provided in textual format, largely commented and annotated. Users can search material through an extremely simple keyword search feature and download them in pdf format or save them on-screen, completely free of charge. Along with a sitemap, each page is available in printer-friendly format and can be promptly emailed to other people. Somehow original is its vertical structure, a clear content categorization and outline enables a good usability level.